Here is a scene I've been working on since the beginning of the spring. I decided daffodils are my new favorite flower. Never really paid much attention to these humble flowers, but they are truly incredible works of nature. At first, I was going to have this be an outdoors scene, but somehow it turned into an indoor scene, a kind of still life. I hope to instill some of my love for 17th century art into this piece. We'll see. Also, before I forget, the name daffodil comes from asphodel (from the Greek ἀσφόδελος), another name for the plant and flower. I started modeling the flowers in Cheetah3D, but I ended up modeling everything else in Blender. As for the render, I used Blender's Cycles. ,The scene is still a work in progress, as I need to work on the textures and add a couple of details. Also, modeling those shears was incredibly fun! 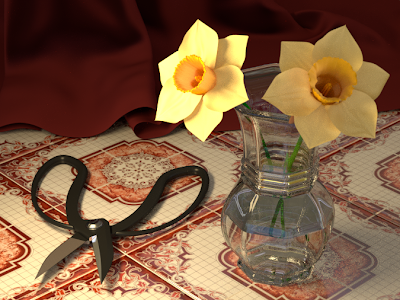 The tile texture comes from the CGTextures site. Rendered to 500 samples on Cycles.